While the Columbia River Gorge holds an incredible number of gorgeous Instagrammable waterfalls, you’ll find less crowds and big views if you shun the herd and head toward the coast; what’s more, the Gorge continues to blaze from the persistent Eagle Creek fire and favorite waterfall trails are closed until Spring 2018, and the coast offers the perfect respite form the smoke and opportunity to still get outside and experience one of Oregon’s most renowned attractions. All rivers lead to the sea, and as they do they create some pretty spectacular falls in the process. The Oregon coast is no exception. Travelers moving east to west along the major highways toward the ocean will find a number of stunning trails and overlooks to enjoy the cool spray of a Pacific Northwest waterfall. We’ve gathered together some gems below worth seeking out. While not technically a hike, this short 100-yard trail is well worth the visit when traveling past the Tillamook Forestry Center. A tiny sign points the way to this off-the-beaten-path waterfall. The lacy fingers of Bridge Creek Falls are worth the stop, especially in conjunction with exploration of the Footbridge Day Use Area. Pair this little jaunt with the Wilson River Trail for additional mileage. 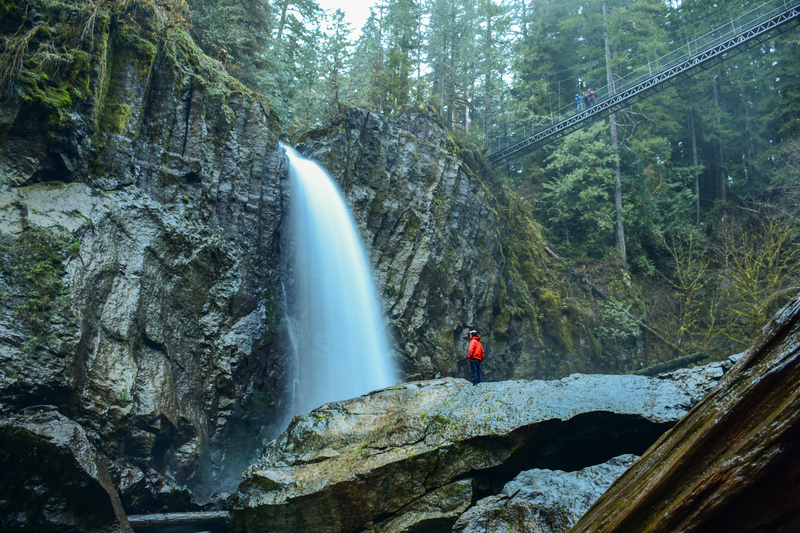 While the 250-foot suspension bridge might be a deterrent for those less keen on heights, don’t let that keep you from a spectacular experience at Drift Creek Falls. The views from above on the bridge more than make up for any nerves created from vertigo. At roughly 3.70 miles, this is a nice hike to stretch the legs. Close to Lincoln City, the trailhead can be approached from either Highway 101 or Highway 18. No matter the season, this is an accessible trail. With both Oregon’s biggest waterfall and the world’s second largest Sitka spruce, this family-friendly trail is a pleaser. An impressive 319 feet of thundering water fills the air with noise in this tiny and protected pocket of trees. While the rest of the forest surrounding this gem has been clear-cut beyond recognition, a cooperative effort between lumber company, nonprofit, and conservation groups worked to protect this bit of beauty for the world. An easy trail for the whole family, Munson Creek Falls is worth the brief stop when driving to and from the coast. Two waterfalls on one trail here. Both Green Peak Falls and Alsea Falls grace this 3-mile trail. In the summer months, a decent swimming hole can also be found along this trail near Alsea Falls as well. Depending on the time of year and the amount of rainfall, these two falls can look dramatically different with each visit. Both are worth checking out in all four seasons. Camping can also be found nearby in a small private campground for those seeking a quiet secluded stay. Not the easiest trailhead to find, and with heavy logging truck use on the road in, Kentucky Falls can be a tad daunting in the approach. Three jaw-dropping waterfalls make this trail worth the effort however. Lower Kentucky Falls, Upper Kentucky Falls, and North Fork of the Smith Falls each hold their own unique character. Higher elevation here means a reprieve from summer heat, making this trail a nice escape. Later in the year, fall colors create a photographer’s paradise. The lack of easy access means that the trail sees far less use than others in the area. Given the congestion found in the Columbia Gorge for other waterfalls, Kentucky Falls is worth the drive. Only 2.2 miles, this trail is sweet in name and in length. Perfect for families with younger kids, the salmonberries along the trail in early summer months make for great snacking as you head toward the beauty of Sweet Creek Falls. Originally settled by Zarah Sweet in the late 1800s, portions of original wagonroad still exist along parts of this trail. An additional waterfall can be added with a brief drive down gravel road 939. Here, Sweet Creek forms a double waterfall with Beaver Creek. The road to Golden and Silver Falls may be closed a mile before the park entrance, but that shouldn’t prevent you from visiting this beautiful trail. Once in the park, two short trails lead to the base of both falls, with a longer trail leading to the top of Golden Falls. With forested switchbacks and even an unexpected meadow along the way, the trail to the top is a delight. Water pours 200 feet into the valley below. Pack a lunch and come prepared to spend a half-day here exploring this park and the falls. The crowds are few and far between.